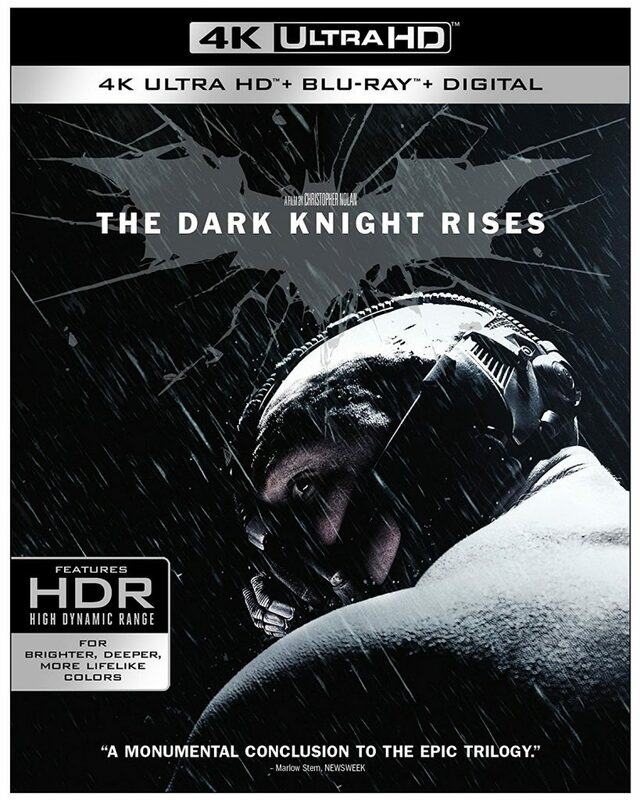 The Video: ‘The Dark Knight Rises‘ comes in strong onto the 4K UHD format with a 2160p transfer with both 2.40:1 and 1.78:1 aspect ratios, because of the different scenes that were filmed in glorious IMAX. With that, the movie was shot on 35mm and 65mm and now has a new 4K transfer, which results in an amazing video presentation. Again, like ‘The Dark Knight‘, this is demo-worthy. Detail is impeccable with the finest and smallest details showing up on film. The textures in the airplane in the first scene look great and the little individual furs on Banes jacket show up easily and are all distinguishable. It’s quite impressive. The heavy CG sequences all look great too, particularly the football game scene. You’ll be able to make out all the tiny dirt and blades of grass as it implodes. 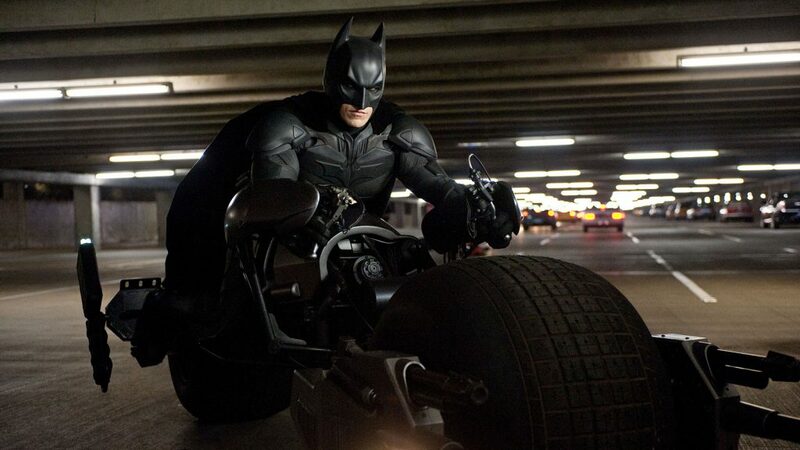 The Batsuit looks incredible with all the imperfections in the leather as does Catwoman’s suite too. Wider shots of the underground prison and the new Wayne manor show all great architectural details as well with bricks and stone. Colors are bright and full of rich detail as well in all lighting conditions. Perhaps the most colorful moment is at the football game again with all of the yellow uniforms, green field, and many different colors of outfits that people wear. Each color is nuanced and deep with the different filters that apply. Black levels are amazingly deep and inky throughout with zero crush as well. The skin tones are natural throughout as well. There are no instances of any banding or video noise to speak of. Demo-worthy upgrade here, folks. The Audio: This release comes with a lossless DTS-HD MA 5.1 mix, which sounds excellent. I just wish there was a Dolby Atmos and DTS:X mix here. Still, the audio presentation sounds excellent here and could be demo worthy in select scenes for sure. Sound effects are loud and robust with each giant explosion of each bridge, gun shot, and use of the Batmobile and Bat-copter. Their noises just propel the sound design into the next level. 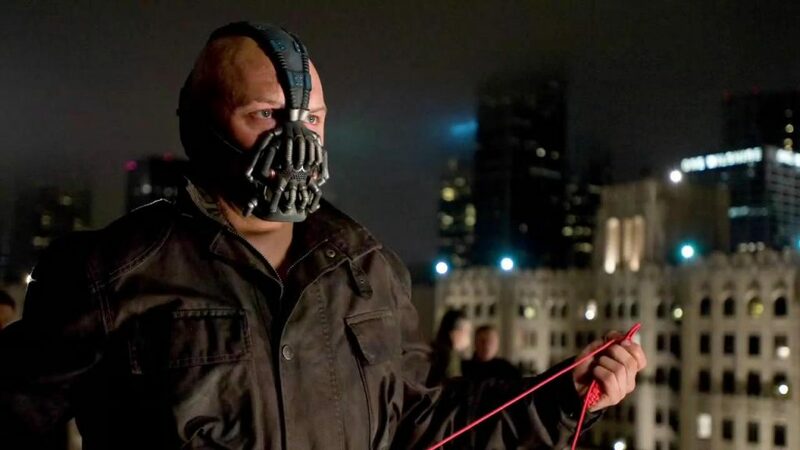 Bane’s voice is deep and mostly understandable, but packs that heft with good bass. Other big sound effects and ambient noises sounds great through the rear speakers too. The big fight scene in the street at the end of the film is spectacular with tons of voices yelling, gun shots, punches, and other city sounds that fully immerse you in to the chaos that’s happening. Not one sound effect is left out and sounds excellent. The score is top notch and always adds to the emotional tone of the film and adds a big element of suspense. The dialogue is clear and easy to understand and free of pops, cracks, hiss, and shrills. A wonderful audio mix here. There are no new extras here, nor are there any extras on the 4K UHD Disc itself, but all the extras are imported from previous releases and show up on the Blu-ray included. The Batmobile (HD, 59 Mins.) – An awesome extra all on the Batmobile that features fans of Batman, writers, editors, artists, and all the ‘Batman’ directors from all previous films since the 1980s. Super cool extra for sure. Ending the Knight (HD, 106 Mins.) – There are a ton of extras throughout here, but does not have a Play All feature, which is super annoying. You’ll have to navigate everything, but the content is excellent with tons of interviews, behind the scenes featurettes, and on-set footage that cover all aspects of making the movie and specific scenes. Still Gallery (HD) – Tons of promo artwork for the film. Trailers (HD, 9 Mins.) – A few trailers for the film. 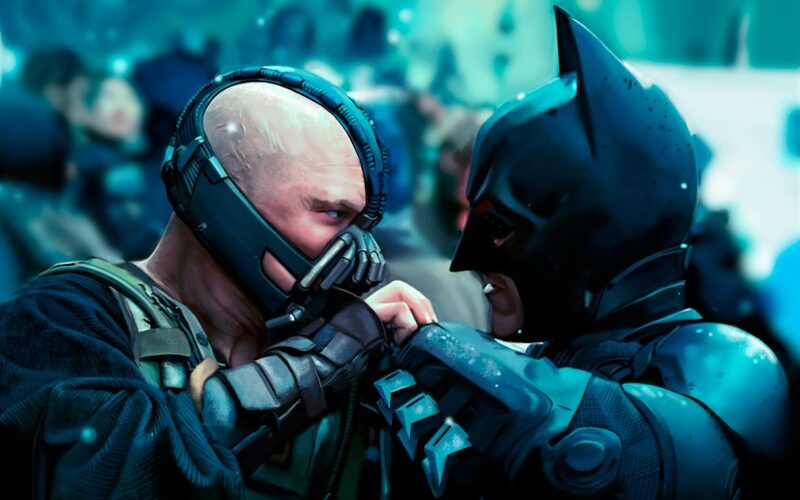 ‘The Dark Knight Rises‘ was an excellent end to this specific Batman trilogy. I loved everything about it. It brought everything to a cohesive and entertaining end. Bane and Batman have a great fight scene and it was very cool to see how Brice Wayne overcame his fear and getting back to saving Gotham. What an amazing trilogy and movie. The video and audio presentations are both excellent here and upgrades from previous versions and the extras are wall worth watching, although I wish there was an easier way to watch them. HIGHLY RECOMMENDED FOR SURE! This entry was posted on Tuesday, January 2nd, 2018 at 7:43 pm	and is filed under Film, News. You can follow any responses to this entry through the RSS 2.0 feed. You can skip to the end and leave a response. Pinging is currently not allowed. « 4K UHD Review: ‘Batman Begins’!